As a follow up to yesterday's post, Blythe Masters Discusses Silver Manipulation, today we have an excellent interview with Mike Maloney on RT News discussing the manipulation in gold and silver markets taking place every day. Again, as I said yesterday, this is not something to get hysterical about. When discussing the markets people openly understand and talk about the fact that central banks and the largest banks have an active interest in moving/"manipulating" currency prices (Bank of Japan entering market to sell yen), government bond interest rates (ECB's LTRO program where they purchased over $1 trillion in government bonds over the past 9 months), mortgage interest rates (Fed's QE programs dedicated to mortgage purchases), or even stock prices (the Fed released an op-ed last year boasting of their impact on stock market prices). 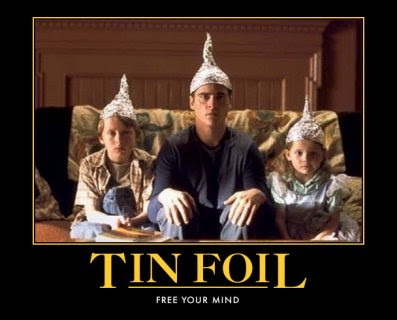 But.......if someone dares mention that after openly and clearly moving these markets, that they also have an interest in moving precious metals prices then you are considered a tin foil hat wearing lunatic. 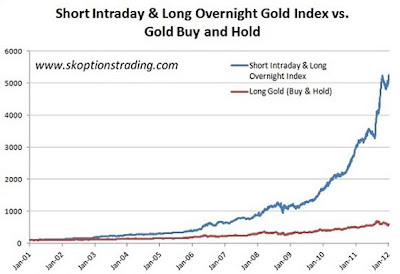 The following chart, which Maloney discussed in the video below and was released by Chris Martensen a few weeks ago, shows the price returns if you just invested in gold and held it from 2001 to present day (red line). 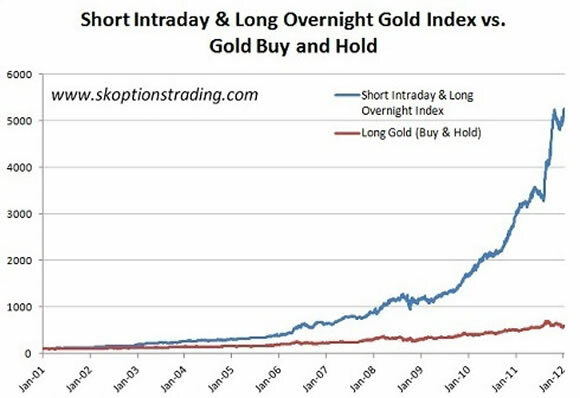 The blue line shows what would have happened to your returns if you "shorted" gold (bet against it falling) during the trading day and then bought it after the market closed every afternoon (went long). What this shows is that gold fell tremendously during trading hours (when it was pushed lower by traders) and soared after hours when the trading day closed. The returns are staggering. Maloney also does an excellent job discussing the technical triggers (stop or sell orders) that are in place. I want to take a moment to try and explain the concept in easy to understand terms. A friend of mine is an active investor in the silver market. However, because he gets nervous about silver's large declines he likes to put stop orders on his trades. Silver today is trading around $32 so let's say he buys X amount of shares of SLV (silver's ETF) and he puts a stop order at $30. This means when silver hits $30 his trading account will automatically sell the silver. Most traders set up these stop orders around key resistance points based on technical analysis charts. This creates a large group of sell orders at specific trading points. Now, let's say I'm JP Morgan and Blythe Masters. Blythe has the ability to look at her computer screen and see this cluster of sell orders sitting at $30 like a herd of cattle ready for slaughter. She has the ability to unload an unlimited amount of silver sales (futures contracts) in a matter of seconds. Without the ability for buyers to respond to this onslaught of selling the price plunges down and connects with the $30 trigger. This then triggers the mass of automatic sell orders pushing the price down even further. This is why sometimes silver (and gold) will cascade down in the middle of a trading day on no news. JP Morgan will then cover the shorts (or a large portion of them) and collect the profits on the move down. It is like printing money. What makes this a no risk situation is that they have the ability to fire in an unlimited amount of sell orders. The silver market is a spec of dust in size making it even easier. An obvious question is, "why does a large hedge fund/bank/investor not take the other side of the position and purchase an enormous amount of silver contracts long to push the price higher and counter this effort?" The metals exchange has limits on the amount of buy orders leaving investors helpless against the selling onslaught. JP Morgan will always have more firepower. During these cascading moves downward in the paper market a large portion of the smart money, especially large funds in Asia, recently have begun to enter the market and purchase physical precious metals. They view each manipulated plunge downward as a gift, understanding that eventually the supply/demand fundamentals of the physical market will overwhelm the paper market. When it does, it is not going to happen in a slow and orderly rise. It will be a violent explosion upward in price. Remember what happened when the government and large banks stepped into the real estate market and artificially pushed the market upward with low interest and 125% financing for every American? Remember what happened when the artificial stimulus/"manipulation" was removed? Market interventions end in a disorderly fashion by nature which can be seen and studied time and time again through history. "We have offsetting positions. We have no stake in whether prices rise or decline. Rather we're running a relatively flat or matched book." I am part of the "blogosphere" that over the past few years has made a case for JP Morgan's manipulation in the silver market. I have written extensive articles discussing their activity, alongside HSBC, both of which at times have taken a short positions that could cover world production out 7,000 years (slight exaggeration, but not much). Due to Blythe's decision to come public and speak about my accusations, I will dedicate another article soon discussing this fascinating topic. I do not moan and complain about our current financial system and how it is structured but only look to study it and learn how best to profit from it as I discussed in Understanding Fiat Money. I also do not moan and complain about JP Morgan's ridiculous and illegal short position. It has allowed both myself and people I help invest to purchase silver at insanely low prices based on normal supply and demand dynamics. At some point the short position will be unwound, just as at some point our bankrupt country will not have government bonds issued with printed currency at 1%. Perhaps both will happen simultaneously. Until then, please enjoy the interview by someone who, just like Jon Corzine, is currently running an illegal activity and will never be punished. As a quick side note for those that have not read any of my previous articles on the subject, I do not think the silver market is 100% controlled or suppressed by these two large banks. I believe that based on the size of the silver market (tiny), and the tremendous amount of data I have reviewed from both sides of the argument, that they have the ability at times to push the market with force through key trading/trigger points that allow their trading desks to front run others in the market. Based on their positions this is almost always done on the short side. For a quick primer on the other side's response, I would take the time to listen to Jim Puplava's recent interview with Ted Butler discussing the topic in depth. 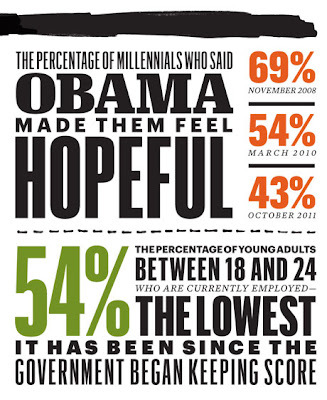 Keep a close eye on the important 6% mark. 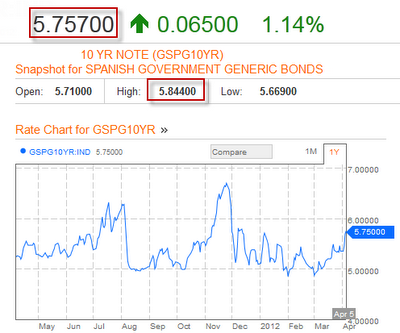 For more on the future of Spain and Europe's sovereign debt, see 2012 Global Market Forecast: Sovereign Debt Review. Bill Gross, who runs the world's largest bond fund valued at over $1 trillion, feels that the Fed is caught in a conundrum of providing cheap liquidity. Gross has made a large move into mortgage backed securities over the past few months in anticipation of the Fed targeting those bonds with QE3. 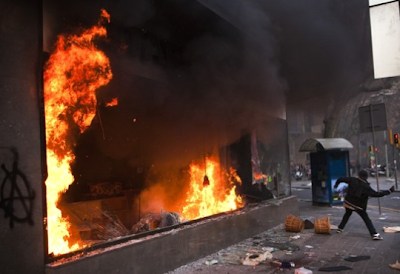 Greek Man Commits Suicide: Will Violence Turn Outward Next? A 77 year old man committed suicide this morning in Greece. The country recently accepted its second bailout in exchange for further government austerity programs. This means spending cuts across the board for many Greek citizens, including the pension funds they have worked their whole lives to receive. These cuts taken by the citizens of Greece are the sacrifice needed to ensure that foreign banker multi-million dollar bonuses continue without interruption. The banks ability to move forward without losses also allows them to continue funding the political campaigns for the current leaders in charge. This process should move from country to country as the sovereign debt crisis spreads to Portugal, Spain, Japan and beyond. "The Tsolakoglou government has annihilated all traces for my survival, which was based on a very dignified pension that I alone paid for 35 years with no help from the state. And since my advanced age does not allow me a way of dynamically reacting (although if a fellow Greek were to grab a Kalashnikov, I would be right behind him), I see no other solution than this dignified end to my life, so I don’t find myself fishing through garbage cans for my sustenance. I believe that young people with no future, will one day take up arms and hang the traitors of this country at Syntagma square, just like the Italians did to Mussolini in 1945"
The boomers are ready for a retirement funded by the younger working generation who want no part of that funding. Something will soon have to give. If A Window Breaks In Spain Does It Stimulate Growth? For those new to the study of economics (or those that have had the misfortune of taking and paying attention to economics taught at American universities) who wish to get an easy to understand primer on the subject, I always recommend beginning with Economics In One Easy Lesson by Henry Hazlitt or How An Economy Grows and Why It Crashes by Peter Schiff. The second is told through story form with pictures. What Austrian economics teaches you is to not only look at the immediate benefit or damage of an economic event or policy decision, but to look at the unseen consequences of the action. The video below provides a simple story that demonstrates the first lesson of Henry Hazlitt's book. It shows why destruction does not add to an economy, but takes away from the whole. This concept is easy to understand when you are walked through the entire process, but surprisingly most economic "authorities" today still recommend bulldozing homes to stimulate growth, prices, or wealth. The second portion of this short video takes this concept beyond to a few of the discussions found in the subsequent chapters of Henry Hazlitt's book, most importantly that government spending is a net drain on the economy of a country, not a net growth or stimulus that we are told today. Once again, after walking through the simple example you can clearly see why this is the case, but most economic"authorities today still recommend a continuous dose of stimulus and spending from our government. What the video does not demonstrate, due to time constraints, is that something is different today than when Hazlitt wrote his book many years ago. The difference is that government spending and government taxation are no longer balanced, meaning we no longer operate in the simple zero sum world described in the example above. In America today, if additional money is spent towards military, health care, and social benefits, it is not reduced somewhere else in the economy because it is taken from tax payers. Why? 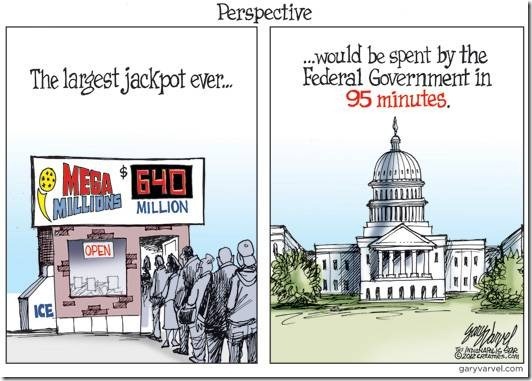 Because of the magic of deficit spending. If the money is not available, IOU's (bonds) will be issued to make up the difference. 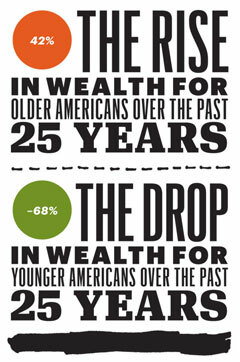 How does this impact the economic model? Deficit spending allows a country to run longer periods of economic growth, as governments are allowed to fill the gap in spending from the private sector by increasing deficit spending, before pain must be felt by the mal-investments created during the boom. Then, one day, when the IOU's are no longer valid because investors no longer trust the ability of government to pay them in full, you do not have a regular economic decline; you have a collapse. When central banking, derivatives, politics, wars, and financial bubbles are all added into the equation it makes the picture far more blurry and difficult to understand. People who can understand the simple examples provided above start to believe that "stimulus is good." Some will even take the time to go vote for it. For those that can see past the distraction and do the simple math which shows we have borrowed too much as a global financial economy to pay back based on the current income and assets available around the world, will understand why the next twenty years will be different than the last. In order to get the global debt to GDP ratio down to 180% (Greece was at about 120% when it collapsed), estimates show that the world as a whole will need to write down about $27 trillion in debt. 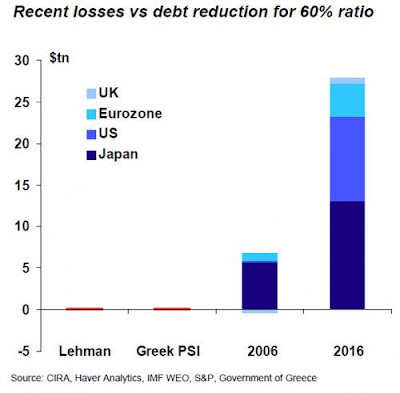 The following graph shows how big this debt write down is compared to Lehman Brothers and Greece (both of which we are told would have ended the world without bailouts). How you think the debt will be liquidated (through default and write down or money printing and central bank balance sheet expansion) should determine how you allocate your portfolio. As I obviously have no idea how it will play out (although I am personally betting on central bank balance sheet expansion), I recommend being prepared for either scenario. I discussed strategies on how to do this in 2012 Outlook: How To Invest. Marc Faber speaks with CNBC on some of the dangers he sees ahead in our "Goldilocks" markets. He has been correctly bullish on stocks for some time, but he sees all the bailouts and money printing only leading to something very troubling ahead for the global economy. He also believes that real estate in southern parts of the United States should not fall much further and are close to approaching an attractive price level. The following video provides an excellent visual demonstration of how a "fiat" money system functions. A fiat system means that money is borrowed into existence at an unlimited rate. Or another way to put it is that money's value is based on the government's ability to tax its citizens in the future, which implies the money's value is based on the credibility of the government itself (a topic we have found out recently is very important). Part of the video discusses the importance of who receives access to the money first in a fiat system. The reason this is so important is that by the time money has made its way through the system, otherwise know as "trickling down," it has already been diluted. There are those that argue that the reason we cannot have a hyperinflationary environment in this country is because the people who have the power would be negatively impacted just as much as the everyday person. By moving through the video demonstration below you see that this is not the case. The government, banks, large corporations, and government contractors get the money first and then it is spent into the economy allowing access from "the rest of us." This simple concept shows that should a highly inflationary environment occur, those at the top will have the ability to protect themselves, and even profit, before the negative consequences of our fiat system are absorbed by the masses. Instead of getting angry at the system itself, which will not be changed as the benefactors just discussed that receive the money first are those that provide the money for politicians to become elected, I would recommend learning how this financial system can benefit you personally. There will be those that are winners and losers moving forward beyond just the banks and government contractors, and I'm not just talking about those that invest in gold. I'm talking about those that understand the power of debt and can wield it to their advantage to create assets. If you understand that money is borrowed into existence, it opens your mind to the way the wealthy think about the world. It is also important that the masses do not understand how this process works, which is why it is never discussed in public schooling. If the 20% of underwater homeowners in this country understood that the money they borrowed to purchase their home was created out of thin air right at the closing table when they signed the documents, instead of money they were borrowing from some older man who has saved his whole life and was nice enough open a bank to lend them the money, what are the odds they would continue to make their mortgage payment on an underwater home? The same happens when an American visits the store and swipes their credit card. The money is not being lent to them from a company who has it stored in a vault somewhere that is nice enough to lend it out. The money is being created right there at the check out line when the card is swiped. Once again, if Americans knew this, how much more likely would they be to work day after day killing themselves to repay that debt with 15% interest? I do not spend my business hours working for money. I spend my working days learning how to build a business (by building a business) and learning how to invest in real estate (by learning how to purchase, finance, and manage commercial properties) because those are the two vehicles that the "average" person in this country can use to borrow debt. Do you know any other reason why a bank (or investor) would lend you money? Think about it for a moment. Central banks around the world print money today by adding zero's to a computer screen. 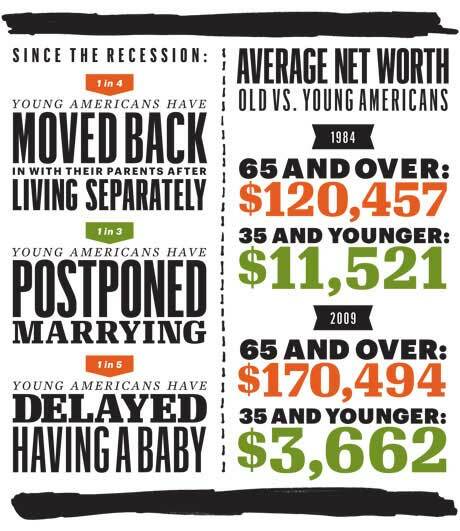 Do you think the average person can keep pace with them by working hard and saving money? You must have the ability to "create money" which is done in a fiat system by borrowing money into existence. This discussion sounds insane to most people, but its importance is immeasurable. Can you work and save money faster than the Fed can print it? If you do not think you can, then I recommend spending some time researching and studying to find a way to achieve leverage.